Gabriela'$ Love World: Fundraising event!! National Council of Women of the United States is a coalition of Organizations and individuals dedicated to the realization of full participation by women in every aspect of society. National Council of Women represents all races, creeds, and traditions. It is the oldest non-sectarian volunteer organization of women in America, celebrating 125 years of service. National Council of Women of the U.S. is an accredited Non-Governmental Organization with the Department of Public Information and consultative status with the Economic and Social Council of the United Nations. 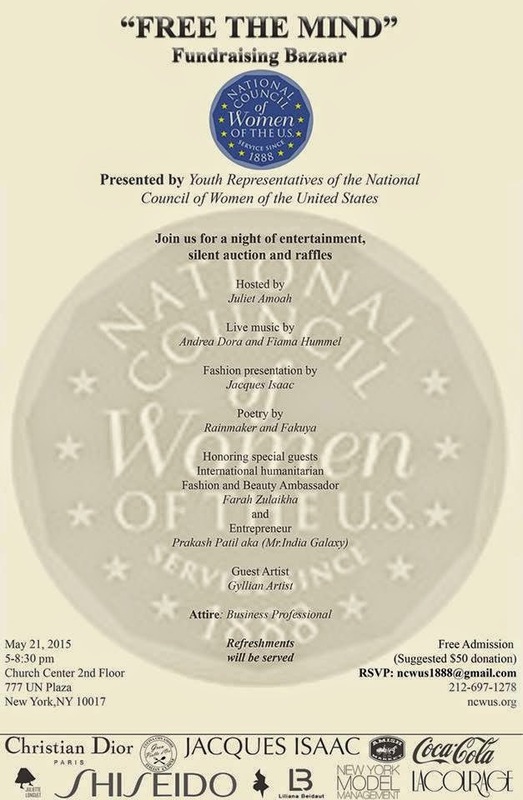 PLEASE JOIN US ON THE 21ST FOR THE AWARDS CEREMONY AT UNITED NATIONS PLAZA AND THANK YOU TO THE UNITED NATIONS & TO THE NATIONAL COUNCIL OF WOMEN OF THE UNITED STATES FOR RECOGNIZING AND STRENGTHENING MY EFFORTS TO BE A VOICE FOR THOSE IN NEED WORLDWIDE!